Are you looking for a solid, to-do list app that syncs with your iPhone or iPad? You’ll find a great choice in Cheddar — available as an iOS app and online at cheddarapp.com. The premise of the Cheddar iPhone app is simple. 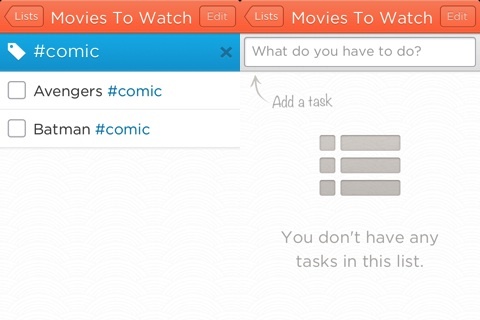 You are free to create lists and add tasks to each list. 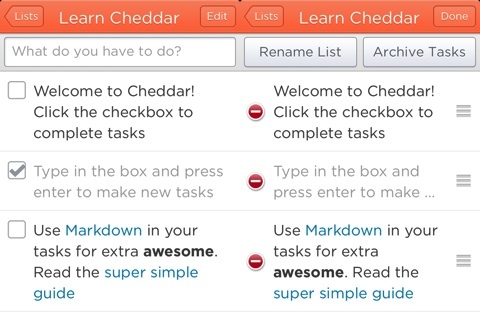 There is a helpful welcome screen with a list of suggestions and guidance to get you started using Cheddar. From the home screen, you tap the plus icon and create a list. The title of the list is at the top of the screen, and you just touch the empty bar at the top of the screen that says, “What do you have to do?” to add a task. You touch the task to complete it, or you can archive task by touching the edit button at the top of the screen. The archive feature functions similarly to the chance to delete or forward a conversation in iMessage. Instead of spending set-up time creating tags and categories, Cheddar simply uses the ubiquotous Twitter hash tag icon. You touch a hashtag on the screen, and a new list with tasks containing that hashtag appears. There is no typing in a search bar, as the sort function is gesture controlled. As a mom, I hashtag each child, so I can quickly sort through the lists. Or, to create a shopping list, you can simply add a hashtag and a store name. When you get to Trader Joe’s, then you’ll find everything you have noted. The Cheddar iOS productivity app syncs with all of your devices, as well as any online entries, to keep you up to date with your life’s tasks and details. Markdown junkies will appreciate the ability to incorporate span elements. Regular folks can simply add a URL to create a link in a task. The free Cheddar iOS app download from the iTunes App store allows you to create two lists for free, so you have to upgrade to Cheddar Plus to continue use. You can buy three months for $5.99, six months for $9.99, and one year for $19.99. It is more expensive than many to-do list apps, but its simplicity, sophisticated incorporation of Twitter’s hashtag, and thorough syncing justify the price. AppSafari review of Cheddar was written by Jenni Ward on July 3rd, 2012 and categorized under App Store, Featured, iPad apps, Productivity, Universal, Utilities. Page viewed 3886 times, 1 so far today. Need help on using these apps? Please read the Help Page.